Bookish Wendy made my Very Necessary Sweater! And she likes it! This makes me so happy. Thank you, Wendy! I've been living out of a suitcase for three days, with two more to go. I moved to my second hotel of the trip last night, and was greeted there by my first (!) headcold of the winter. Sprinkle in extra-long days of work, and I'm pretty much wiped flat. 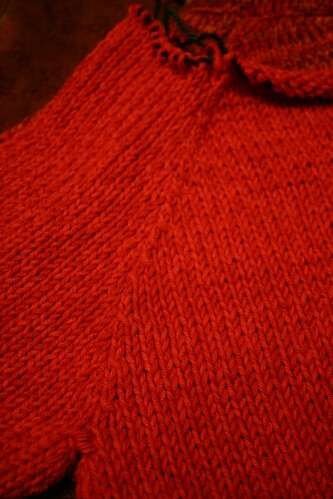 Even so, I couldn't resist a few cameraphone pictures of the now-finished Olympic sweater. That's right, it's finally done. Real photos, along with a Mild Conceit Session, to come when I recover! What's the best way to do a turtleneck? I've noticed that many patterns have you bind off some or all of a neckline, only to turn around and direct you to pick up stitches for the collar. Is there a good reason for this, or is it like when Rowan tells you to bind off and seam shoulders when 90% of the time a three-needle bind off is clearly the better option? As you are all painfully aware, my Olympic sweater is a raglan knit from the bottom up, and I've left the stitches on holders while I debate how to proceed. Put all of the stiches on a circular needle, and knit the turtleneck in the round? Bind off and pick up? Another technique you can tell me about? It's not what I intended to do for the Olympics, but sometimes the best results come unintentionally. I really, really love this sweater! I made it with oddments of yarn that Knitsmith Lisa gave me. It was a typical act of Lisa-esque generosity: "You knit with cotton. Here, take these three bags of yarn." And before I could protest, she was gone. And how goes the original Olympic project, you ask? Well, as evidenced by its absence in this post I did not finish it in time. But I made good progress yesterday when my back of the envelope calculations for the turtleneck set-up rows worked on the first try! After the other calculating and counting woes with this sweater, I think this proves that I just really needed a break from it. Unfortunately, that break has to last a bit longer, as I have a baby shower present that must be done very, very soon. I should be back to the Olympic sweater by the end of the week! Get comfortable, dear readers. This is a long one. When we last checked in on the Olympic sweater, I was basking in my victory over non-linear raglan lines. While admiring my work, I was startled to realize that one feature of my model sweater's raglan lines had been entirely left out my Olympic sweater: the purl separators. I don't have a great picture of them, but you can sort of see the "valley" they create along the raglan seams here. My Olympic sweater seams had no such valley. 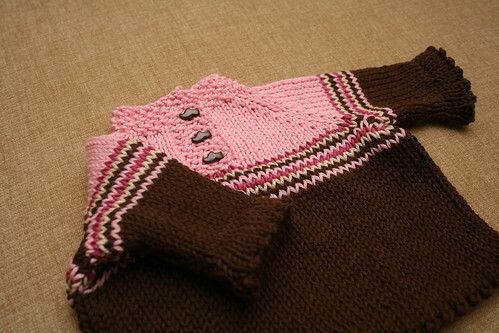 As of bedtime on Wednesday night, all of the pieces had been knit (or re-knit) with the new and improved raglan shaping. 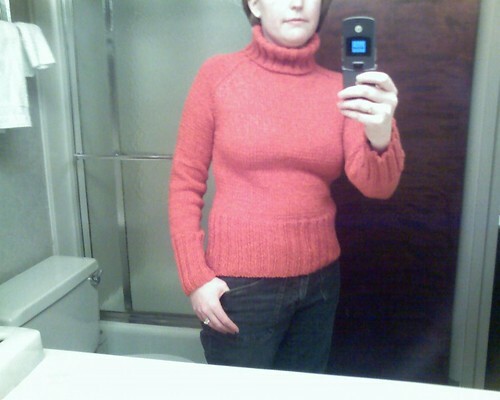 All that was left were the few rows at the top of each piece to set up for the turtleneck, the seaming, and the turtleneck itself. We're traveling to NYC this weekend so knitting time will be limited, but I thought my medal chances were still pretty good. 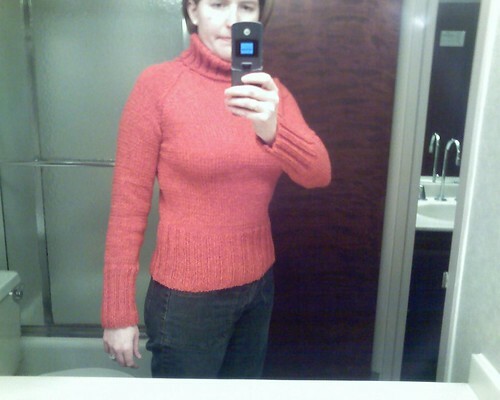 As soon as I got home from work, I did some quick seaming for the preliminary try-on. 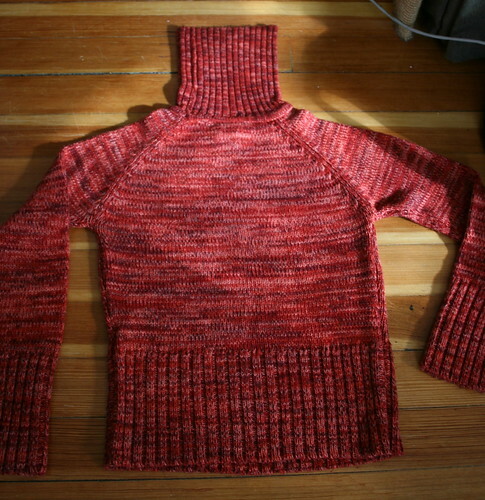 I had already attached the sleeves and started basting the side seams when the feeling of dread started. I kept wondering why the front and back seemed to be different lengths. It turns out there's an easy answer: because they are. First I put a marker on the last row before the armhole. Then, working from the bottom up, I put a marker every 10 rows. 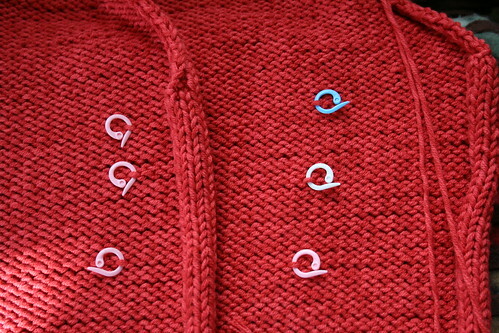 The stitch markers on the two pieces should be spaced identically if there are the same number of rows from the cast on edge to the beginning of armhole shaping. Read it and weep. I need to add four rows to the length of the front, but I have to rip it back to the armhole to do it. And that, ladies and gentlemen, may keep me off the podium. I'm not usually one to shy away from a challenge, but there's a good reason I'm reluctant to take this one on: my hands, wrists, and elbows are killing me. Knitting on nothing but this yarn at this gauge for nearly two weeks has really done a number on them. Powering through a re-knit of the front doesn't seem like a good idea just now. 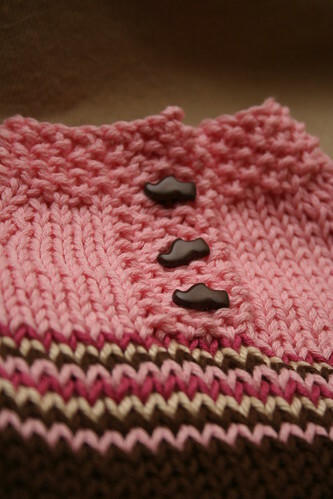 When I first considered joining the Knitting Olympics, I consulted my mental "babies-to-be-knit-for" list and verified the Games wouldn't conflict with any baby knitting. I had two entire weeks after the end of the Games before the next baby would need a welcome gift. Except, not. This little madam not only managed to be born four weeks early but also on the day of the Opening Ceremonies. That means we'll get to meet her this weekend in New York while we're there on a trip that we thought would be two weeks before her arrival, which is thrilling. It also means that I was about to break my cardinal rule of baby knitting: don't meet the baby empty-handed. A change of gauge and fiber would do my aching joints a favor. And it seems right that if I have to take a break from my official Olympic knitting that I should use that time to make something to welcome a little one born during the opening of the Games, and who I'll meet during the closing weekend. Seems like I might salvage my Olympics after all. 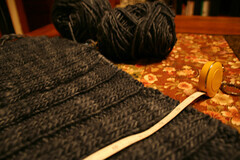 The raglan shaping of my sleeve roughly followed the shape of the sleeve of my model sweater. The raglan shaping of the back was exactly the same as the shaping for the sleeve. The top of my back piece was much too narrow. A re-write of this section of my pattern was clearly in order. I consulted Jenna's awesome sleeve tutorial to make sure I had a grasp of the general raglan principles. I measured again (and again) and sketched out the raglan lines on graph paper. Somehow, the numbers still weren't working out right. At this point, Jason got involved, and there was much talk about how one calculates the slope of a line and the Pythagorean theorem. This served as a great geometry refresher, but still didn't solve the problem. Finally, I put down the measuring tape and graph paper and looked -- really looked -- at the raglan lines on my model sweater. Eureka! Those lines aren't straight! Looking at the raglan shaping on the body, the first four decreases are worked every four rows. The remaining decreases are then worked every other row. This makes the raglan shaping "bow" out a bit rather than follow a straight line from armpit to neckline. Here's the real kicker: in order to make the sleeve and body fit together, the "bow" has to be reversed on the sleeve. So the decreases are worked every other row for the first 12 rows, and then every fourth row for the rest of the sleeve. I did some quick calculations to get the same effect on my raglan sleeves, ripped back, and tried again. This time, it worked. Just when the Boston area weather has started to beat me down -- as it does every February -- here's something to get happy about: progress on the Olympic Sweater! 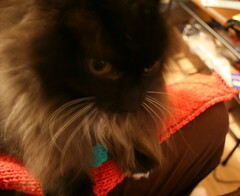 Heartened by my success, I cast on for the back and started knitting with abandon. Now that I knew my calculations were generally on target, I could knit much more quickly -- that is to say, without stopping at the end of every row to measure, hold up to my body, hold up to the model sweater, re-measure, etc. On Wednesday night I finished the 5 3/4" of ribbing on the back, and by the time I put the needles down last night I was through the 7 inches of stockingette stitch and had started the armhole decreases. Zooooooom! My progress as of last night. Knitting goes fast when you're watching Seth Wescott. Rawr. My progress this weekend will determine whether I've got a speed skater's chance in Hades of getting this sweater done before the flame is extinguished. One thing is for certain, though: these knittin' hands and wrists are going to be sore by the end of the Games. Pass the Tylenol and ice packs, please. *This is not the actual color. The light was so low I had to use the flash -- it's not that pink! About mid-last week, I was beginning to get a bit worried about the fate of my Olympic yarn (end of this post). I was headed for DC for a combined work/play trip, and had everything precisely planned to allow for maximum Olympic progress under the circumstances. Early in the week, I made a schematic of my favorite sweater with tons of notes on measurements. Thursday evening, in the quiet solitude of a hotel room, I would swatch and plug numbers into my schematic to produce the rough outlines of a pattern. Then I could spend the rest of the weekend knitting while chatting with friends. Seems like a pretty good plan, right? Well, sure, if you actually have your yarn. I will not belabor the story (here's the gist of it), but I learned on Wednesday afternoon that the yarn wasn't coming. With less than 24 hours before I was to take off for the nation's capitol, I needed to work fast to salvage this project. So I went where any 21st century knitter goes when she gets in a bind: Google. The result? Knit Happens saved my Olympic dreams. When I saw that they had Samoa in some nice colors on their website, I sent Kristine -- the owner -- a plea an e-mail asking about availability in the store. (Seriously, if e-mail "tone of voice" could be translated into audible tone of voice, my email would have shrieked with desperation when she opened it.) Despite my near hysteria, she responded quickly and calmly. Less than 24 hours later I got off a plane at National Airport, drove 6 miles down the road and walked into the store to pick up my yarn. It was, without a doubt, one of the best yarn buying experiences I have ever had. I don't think the transaction posed a huge inconvenience for Kristine and the gang at Knit Happens, but it really meant a lot to me. (YARN STORE OWNERS TAKE NOTE: This is how you get and keep customer loyalty.) And did I mention the store itself? Beautiful and friendly. I can't think of another yarn store that had more awesome sock yarn -- Lorna's Laces, KPPPM, Cherry Hill, ArtYarns Supermerino and Ultramerino -- in more varied colorways than this one. I did make some progress on the sweater, but that'll have to wait for at least a day. In addition to a yarn debacle, this weekend's snow fall also caused a travel debacle. Our flight back was cancelled last night, so Jason and I were on an early morning shuttle this morning. I'm living on little sleep, no shower, and out of a suitcase. Give me 24 hours to regroup, and I'll be back -- I still have so much to tell you! *But wait!, you say. That's not the red we heard about! Here's the thing . Back when I ordered the Samoa (the first time), I had been on the fence between the bold solid red and the subtle orange/red/pink variegation of Samoa Mouline number 504 colorway. 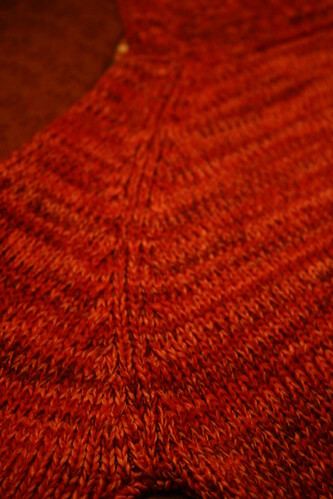 I first went with the safe bet -- solid red -- but Knit Happens only had the variegated version available. I figured this whole debacle was a sign to take the risk and buy the variegated colorway, and boy am I glad I did. It's gorgeous. It has negative ease -- like four inches worth around the bust. I would never have guessed this, since I don't think of this as a particularly form-fitting sweater. I spent an inordinate amount of time tugging on the sweater to see how stretcy it was (very), and trying to decide if I should assume equal amounts of stretchiness from my own knitting. The juy's still out on this. It has waist shaping. It's subtle, but it's definitely there. The wear and tear on the sweater has made the stitches really blurry, so I had to do some guessing on the direction of the shaping in a couple of places ("is that an increase or a decrease?"). I'm pretty sure I got it right, but I might use the waist shaping from Mango as a model since the gauge is similar and I know it works. When my yarn arrives, I'll swatch and test for stretchiness -- and then I'll get out the calculator and get down to business. 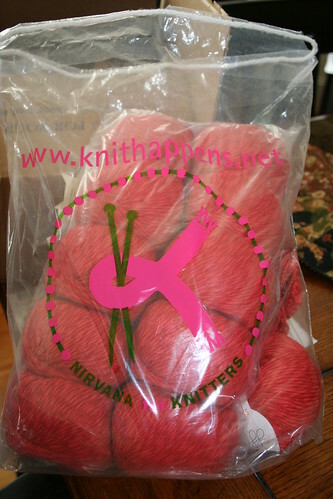 And yes, I said when my yarn arrives. I got great input last week on possible cotton blends; that list will definitely come in handy for a long time to come. 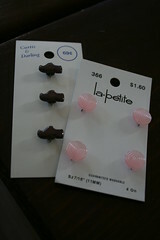 There were especially good recommendations on warm-weather cotton yarns like Cotton Plus and Lara. But when I made up a comparison list -- I didn't need a spreadsheet, but it was close! -- I kept coming back to the GGH Samoa in red (color #23 here). So that's what I ordered. Here's the kicker -- I'm leaving for DC on Thursday afternoon. I've got a work thing all day Friday and we're spending the rest of the weekend with friends. I've been a bit bummed that this trip means I'll miss the Team Boston Opening Ceremonies shindig, not to mention the fact that I might not get very much "sit and knit" time during the crucial first 48 hours of the Olympics. Now, a new source of agita: my yarn hasn't arrived yet and I'm starting to have visions getting on that plane empty-handed on Thursday. It's enough to give a girl nightmares, I tell you. I feel I am most effective when I am given challenging tasks and the opportunity to work on a team. So why not extend that theory into knitting? I posted my first entry today on the Team Boston blog. Here's the short version: I'm knitting a sweater. Oh, and I'm writing the pattern, too. More to come once I've found my mind... which I've clearly lost! I've been spending most of this week on Pam, and just doing a row or two on Zippy at the end of the evening. 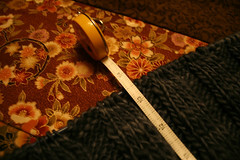 Last night, I took it off the needles and wrapped it around Jason's mid-section -- things look pretty good size-wise. This weekend, I'll be spending some time with the old calculator, since the raglan shaping and sleeves are coming up soon and my row gauge is -- as always -- a bit off from the pattern. I'm going to look at the instructions for the collar, too, since I've read that it looks a bit oversized for a guy when it's not standing up. Gotta get hubby's first handknit sweater right! See those stripes? Good thing I'm alternating skeins! There's a lot of theories about family size and birth order and their effects on personalities, but there is one thing that I now know for sure: only children crave the rivalry they don't get from siblings. How do I know this? Because despite being grown women reasonably resistant to childish impulses, when it came to knitting the Zip-Up Cardigans Alison and I -- both only children -- were off to the races faster than you could say "cast on 172 stitches". Like Alison's son B., we're both guilty of uttering the words "it's not a race!" when we're feeling like we might be a bit behind. Speaking of competition, I'm going to be an Olympian! (Holy Harlot that's a big knitalong. How big? There are SIX SEVEN Shannons on that list -- and I'm not on there yet!) I haven't decided what to knit -- I'm having trouble coming up with something that is both challenging and appealing. Maybe some more lace? A design of my own? Suggestions from the peanut gallery are encouraged!